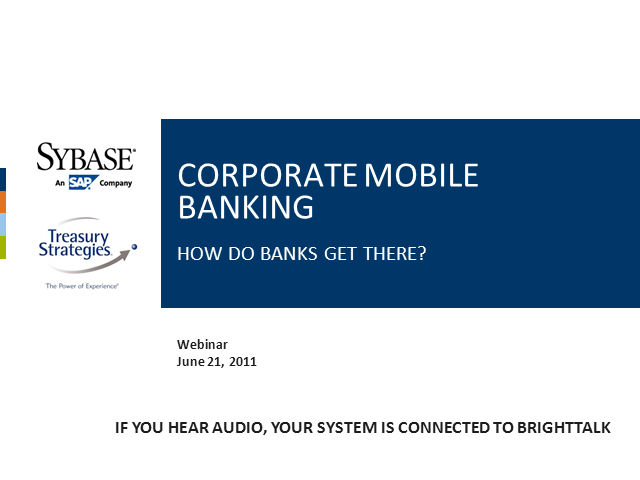 Corporate Mobile Banking – How do Banks get there? Corporate Mobile banking is no longer being perceived as an interesting option, but is considered an essential business imperative that lays the foundation to more robust offerings in the future. The mobile phone represents more than an extension of online banking; it offers an opportunity to reach and meet the changing demands of current and new customers. Introductory Corporate Mobile Banking solutions currently allow corporations and small business owners access to simple banking services such as such as alerts, account balances, customer service, bill payments, fraud alerts etc. As corporate mobile banking consumers mature and begin to appreciate the mobile channel, banks will begin to introduce more interactive functionalities like positive pay decisioning, payment approvals, wire releases payment initiation. This webinar will discuss key success elements to consider when developing and implementing a corporate mobile banking strategy. Mobile services must be ubiquitous meaning they should be available anywhere and able to communicate across service providers as well as country boundaries. A concept called IPX or IP eXchange is a global interworking and interconnection cloud that enables a wide variety of services – especially for today’s increasingly IP ecosystem. While the direct beneficiaries are Mobile Network Operators, the IPX will also benefit fixed and OTT service providers as well as Enterprises and of course, ultimately the subscribers or end users. Showroom Syndrome is when consumers browse products in brick and mortar retail locations and purchase those items online. In the past few years, this "syndrome" has helped lead to the demise of many well-known chains. Retailers not adapting to today’s new marketplace are doomed to repeat many of the same mistakes their out-of-business predecessors made. The mobile channel provides an increasingly powerful set of tools that can bring consumers back into brick and mortar stores. The right mix of products, a continuous engagement cycle, leveraging loyalty, coupons and other tactics will enable enterprises to learn and understand consumer behaviors and in turn shape consumer experiences. This will require a multi-channel, multi-faceted mobile strategy that will promote consumers to purchase products in brick and mortar locations, as opposed to purchasing online. The mobile revolution is about the ability to access data regardless of when, how or where you need it, but going mobile with customer relationship management is much more than convenience. It's about bottom line impact by engaging the end customer in a timely and relevant way. Retail and brand owners are becoming aware that the use of mobile in a piecemeal fashion with no real follow up or ongoing dialogue with customers, and little tie-in to larger in-store loyalty schemes do not yield desired results. Many are increasingly shifting to a more ‘personal relationship management’ approach with their campaigns, which looks at using the mobile channel to create ongoing relationships with consumers, tying existing campaigns and mobile loyalty programs together and using analytics to measure and improve interactions with customers. In fact, getting your Brand into the consumers’ hands has never been easier. In this installment of the Sybase 365 Webinar Series, our panel of industry experts will present changing trends in the use of mobile in marketing, showcasing regional and global case studies; have an in-depth discussion on ways to build a value-added ‘go to market’ mobile strategy; and most importantly, how to engage your customers in a ‘personal relationship’ with your brand via the mobile channel. •How IPX services can provide a variety of functions for today's 3G and fixed operators as well as trusted enterprises. •The variety of solutions today and more tomorrow as services evolve across the telecom ecosystem. •How soon this evolution will take place and the challenges and opportunities it presents along the way. With the growth of worldwide mobile financial services poised to reach $250 billion by 2012, banks and financial institutions now realise that mobile financial services are an essential business imperative that will result in more customers, increased revenues, and differentiation. Yet the challenge lies in positioning these services to serve existing customers but also attract new customers while being able to technically address the entire range of mobile platforms in the market. What business, roadmap and technical decisions should Banks consider to ensure uptake of mobile services, and ultimately the monetisation of their mobile financial services strategy? - Why financial institutions should consider mobile banking services as a strategic point of differentiation for all customer segments? - What the success factors (and pitfalls) in mobile banking implementations are? - How a meaningful strategy to provide mBanking across all mobile platforms looks like? - What the building blocks of a robust mobile roadmap for financial institutions are? You’ve heard the rumblings for years that mobile is the next “big thing”. The time of speculative talking is over. With the mobile channel now being the most ubiquitous way to reach current and future customers, Customer Relationship Management (CRM) takes on a new meaning. o Mobile CRM - What exactly does it mean and why it is fast becoming the most important channel for retailers and brands. o Customer acquisition and offers through the mobile channel. o Mobile coupon redemption through existing POS equipment. o How to drive customer loyalty and retention. o Why mobile coupons appeal beyond traditional coupon users and have higher redemption rates. o The need for multi channel mobile strategies (SMS, MMS, Browser, Apps, Voice). o The impact location services will have on mobile CRM. o How to get started, the ABC's of mCRM. -New technologies subject to operator-specific implementation: How to decouple your 4G deployment from that of other operators' and still maintain critical interoperability? -Maintaining legacy data and messaging revenue streams over an extended roll-out and adoption period: How to ensure your 4G customers can still interact with your 3G customers? -Ensuring return on investment in 4G equipment and spectrum: How to map network resource usage to billable events? -Capturing new revenue opportunities: How to bring new applications and services to market quickly and cost effectively? With the number of mobile phone subscribers surpassing 4 billion, which more than doubles the number of internet users, and with the many Asian nations having less than 40% mobile phone penetration, it is easy to see that the opportunities for mCommerce and mobile money services will be from Asia’s emerging markets. • Mobile Banking - What are the next generation mBanking solutions? • Mobile Remittance - Has the playing field leveled out for Banks and Mobile Operators? • Mobile Payments - What are the new payment frontiers? Join us in an expansive discussion on the infinite opportunities mobile messaging offers enterprises. From Mobile Marketing to Mobile Advertising, learn how to use messaging to add value for your customers and increase your bottom line. 1) Mobile Messaging: Maintaining and growing the reign of messaging in a competitive ecosystem. 2) Mobile IP-based services: How Mobile Operators should view Mobile IP-based services as central to future growth in an increasingly converged fixed/mobile telecoms industry. 3) Telco/ Operator Analytics: Addressing Telco's needs of visibility into their off-network message traffic. Operator Analytics provides advanced tools for analyzing message traffic in real-time to improve Quality of Service (QoS), save money, and avoid costly customer service calls. Mobile banking is no longer being perceived as an interesting option, but is considered an essential business imperative that lays the foundation to more robust mobile payments and mobile commerce offerings in the future. The mobile phone represents more than an extension of online banking; it offers an opportunity to reach and meet the changing demands of current and new customers. This webinar will discuss how Banks can implement successful mobile strategies through case studies. In depth discussion on the state of the economy and maximizing the value of mobility. Title: Corporate Mobile Banking – How do Banks get there?